Last week, the Wall Street Journal reported that numerous online-to-offline (O2O or on-demand) startups in China had run out of cash in recent months. Fund raising and valuations, especially those for on-demand startups, have soared globally as burn rates grew in sync with risk appetite. During this time, startups spent heavily as user acquisition became the primary goal. It was only a matter of time before investors paused to look at financial health. Unfortunately, at least so far, there hasn't been much consensus on the way to assess the financial health of mobile commerce startups. A few months ago, I posted my analysis of Uber's financials and concluded that investor risk appetite had reached unsustainable levels. 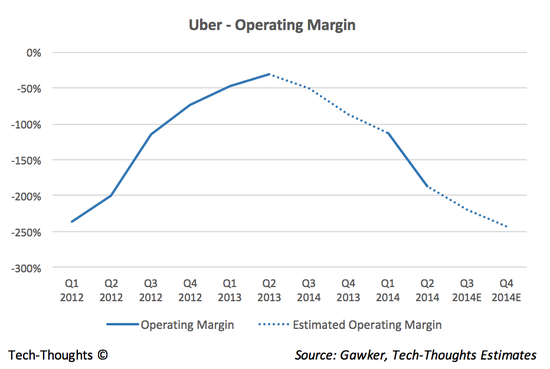 Some observers weren't as concerned with Uber's cost base as gross margins were healthy and rider/driver acquisition investments could be "switched off" at anytime to gain profitability. Investments into Asian O2O and commerce startups appeared to follow a similar philosophy -- use heavy discounts to attract users and make up for it over time. Previously, I have been a strong proponent of the value of subsidies. But this is usually valuable when engagement with a cheap/free product is leveraged to generate revenue/profit from an entirely different product. But subsidizing a product that also happens to be the core profit driver is problematic. High cost of customer acquisition only makes sense when the lifetime value of the acquired customer is high, i.e. the customer remains loyal to the service and uses it frequently over a long period. However, subsidies tend to attract price sensitive customers (and suppliers) who tend to have much lower lifetime value, i.e. customers that look for the lowest possible price. This is major problem in price sensitive Asian markets like China and India. This has been exacerbated by the fact that the number of on-demand startups motivated to buy customers has exploded. This seems to have created a prisoners' dilemma -- it would benefit all companies to stop subsidies, but doing so risks losing customers to the company that continues to subsidize. So in the end, everyone continues to lose money until cash runs out. In this scenario, there appears to be only one possible end game -- smaller startups run out of cash and the larger ones merge to form one major player (at least in each major region). Unsurprisingly, this shakeout already seems to be underway. Chinese taxi booking startups Didi Dache and Kuaidi Dache have already merged. The combined entity, Didi Kuaidi has led investments into regional competitors Ola Cabs, GrabTaxi and even Lyft. Meituan, a group buying service, also just acquired Dianping, a restaurant review service, for $20 billion. This shakeout could soon affect highly valued Indian commerce startups as well (e.g. Flipkart, Snapdeal, Zomato, etc. ).